Barcelona IVF is a modern fertility clinic in Barcelona, Spain. It boasts a team of highly-experienced professionals who are experts in assisted reproduction. They use the latest technology in fertility treatment, and guarantee personalized treatment to all their patients to ensure that the patient feels well looked after and to achieve the best outcome. Their team is multidisciplinary with a wide range of experience in the field of fertility. At their fertility clinic, more than 95% of embryo transfers occur at the blastocyst stage, which promotes the best outcome. Barcelona IVF use the most advanced IVF laboratory. More than 90% of patients at the clinic achieve a pregnancy. They guarantee the highest quality egg donors by using a genetic test to rule out 250 different hereditary diseases. The clinic’s data is audited by the Catalan Government to ensure transparency. Barcelona IVF has staff that can speak a range of languages for your ease of mind. They offer round-the-clock service, available 24 hours a day every day. 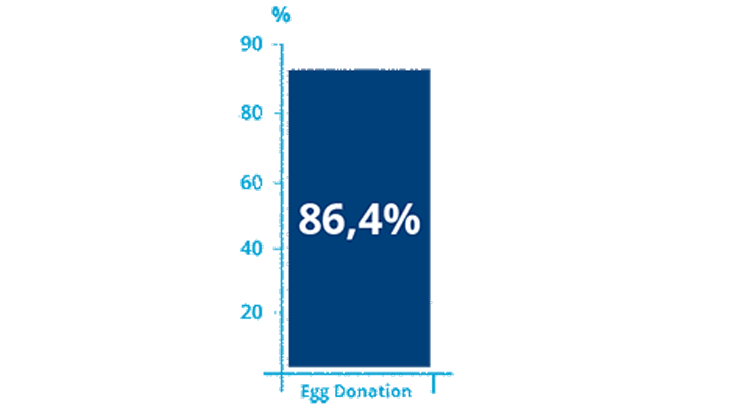 One of every three cycles of egg donation happen in Barcelona, making them the IVF capital of Europe. The clinic boasts no waiting lists. The high-quality IVF clinic has excellent results. 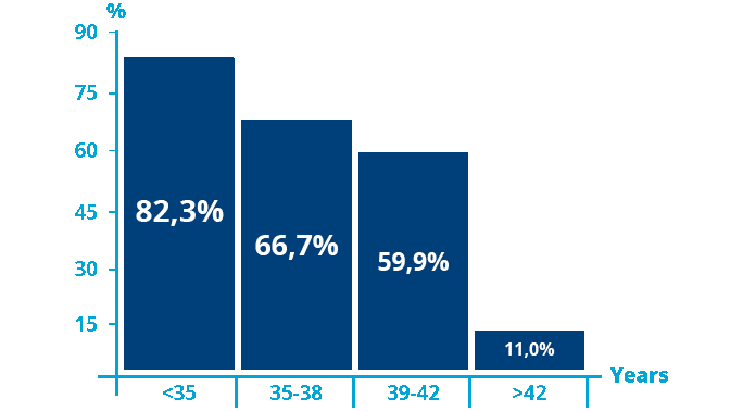 This graph shows the pregnancy rates by age groups following the transfer of fresh and frozen embryos in the same cycle. In this graph you can see the pregnancy rates following the transfer of fresh and frozen embryos in the same cycle. Barcelona IVF is extremely accessible for international patients. They have English-speaking staff, and you can access the clinic by taxi, bus and train once you have arrived in Spain. Barcelona IVF is a state-of-the-art fertility clinic in Barcelona, Spain. Experts in fertility treatment, they use the latest technology and guarantee personalized treatment to all their patients to ensure the best outcome. Find out about other people's experiences of the Barcelona IVF.